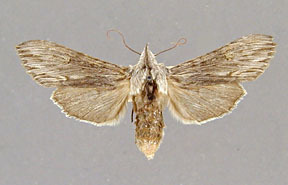 Rancora strigata Smith, 1892, Ent. News, 3:253, pl. 10, upper left corner. Rancora brucei Smith, 1903, Canad. Ent., 35:136. Rancora ketchikana Barnes and Benjamin, 1922, Contrib. Nat. Hist. Lep. N. Am., 5(1):30. Diagnosis: Cucullia strigata is characterized by; 1) the fairly uniform dark gray color of the forewing, 2) the presence of dark, prominent black streaks in the terminal and subterminal areas of the forewing, 3) a prominent black basal dash in the forewing, and 4) the dark coloration of the hindwing in both males and females. Unfortunately all of these characters are subject to a pronounced within population variability. In particular the black streaks on the forewing vary from pronounced with black accenting to almost entirely absent. The color of the male hindwing varies from brown to white with patches of dark brown scales. 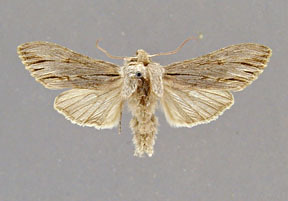 Cucullia strigata may be separated from serraticornis by the darker, more uniform gray forewing color, the brown coloration of the male hindwing, and the presence of black streaks on the forewing. 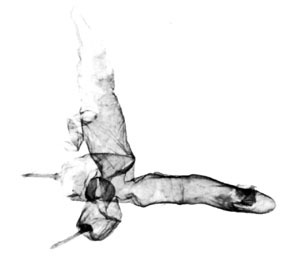 The differences in both the male and female genitalia between strigata and serraticornis are discussed under serraticornis but in summary involve a much longer neck of the ovipositor and ductus bursae in strigata and the wider clasper in the male valve. 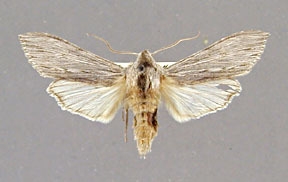 Cucullia strigata is usually much darker than albida. 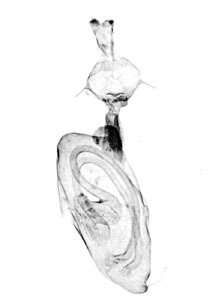 There are small differences in the male genitalia between albida and strigata. 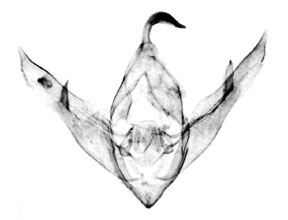 In particular the apex of the valve is slightly more strongly produced in strigata. However the variability within a species and between species is so broad that I am not sure this difference will be consistently true. The major genitalic difference between the two species is found in the female. The ovipositor neck is about as long as wide albida. In contrast the ovipositor neck is approximately 3 times longer than wide in strigata. The two species appear to be mostly allopatric, but there are indications of some overlap in their ranges. 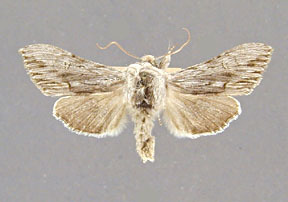 For example there are specimens of both species labeled Calgary, Alberta. The types of albida and of one of the synonyms of strigata (brucei) are both labeled Garfield County, Colorado. Curiously, perhaps, in all of the material collected by Barnes at Glenwood Springs, the presumed collecting locality in Garfield County, there are no specimens of albida. Calgary, Alberta as a locality was used in a very broad sense in earlier days. Therefore neither case of range overlap can be considered proven. Wing length from base to apex: mean = 21.74 mm., standard deviation = 0.53 mm., n = 10. 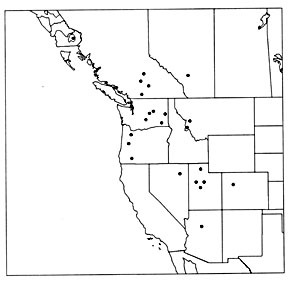 Distribution: Cucullia strigata is primarily a species of the Pacific Northwest and the Great Basin. It occurs in Utah and western Colorado, Oregon, north through Washington, British Columbia, and as far north as the southern most extension of Alaska. These Alaskan specimens were the basis of the name ketchikana and are darker than typical strigata. The southernmost extension of the species is along the Mogollon Rim at Sedona in north-central Arizona. Adults have been collected in April and May.